With the political climate in the country changing, the old guard is speaking out again. Mr. Young, at the age of 71, put together an album of topical songs ranging from Standing Rock, to hair-triggered policing, to paranoia. The album was recorded in 4 days with only star sessions men, Jim Keltner on drums and Paul Bushnell on bass to accompany Neil on electric and acoustic guitar and some really nasty harmonica screams. Some of the simplicity and haste leads to weaknesses of the album that is otherwise conceptually sound. The title track opens the album with a classic Young riff and Neil telling us that he’s not ready to give up; “I’m gonna keep my hand in / Because something new is growin‘. He’s always been a good observer of the now. 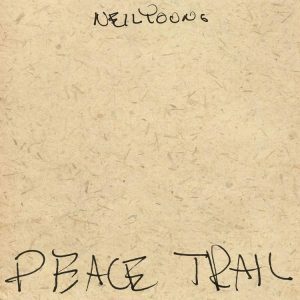 Like an old bard going from town to town to sing the news, Young accomplishes that by hitting the peace trail. He then tells us “He Can’t Stop (Workin’). It’s a reminder to be vigilante and not to give up. Both “Indian Giver” and “Show Me” are overtly about the Indigenous People of the US and their battle over land rights and the possibilities of water contamination. The latter’s riff sound a lot like Clapton’s acoustic version of “Layla.” But this isn’t the first time Neil has a borrowed a tune. “Texas Rangers” and “John Oaks” are both about cops and guns. Musically, “Texas Ranger” is one of the strangest compositions I ever heard by Young. It’s like dissonant acoustic reggae done by the Shaggs. It’s nearly unlistenable. It is also a good counterpart to Young’s recent divorce, “covered broken pieces of a love dream lingering there/that could do some damage for everyone.” It’s the most realized composition on an album of whose beauty lies in its sparseness, but suffers from it being too quickly pushed out of the studio. But a mention of the history of America doesn’t need to be the bed for Neil to justify his distaste for cell phone. Based on the habits of the populace, maybe this album isn’t for everyone. Neil Yong fans should give it a listen though. Posted on Tuesday, January 10th, 2017 under Record Reviews. You can follow any responses to this entry through the RSS 2.0 feed. You can leave a response, or trackback from your own site.